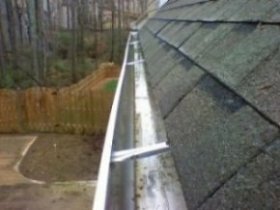 Gutter cleaning is an ongoing and very important home maintenance task that should not be ignored until the fall season. 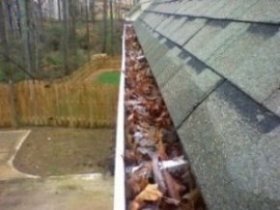 We recommend that you have the gutters cleaned at least once a year in the fall, however most the homes we do have it done in the spring time too. Gutter's that are filled with debris don't allow the rain water to be taken away from your foundation. Typically when this happens the water runs over the top of the gutter eroding your landscaping, filling up basement window wells, and soaking into the ground around your foundation causing water to seep into the basement. If you are having water problems in your basement the first thing to do is get your gutters cleaned. This will usually stop the problem. When our crews arrive the first thing they do is walk around the house to inspect for anything that may be in the way. Usually we have to move outdoor furniture, grills and kids toys so we have safe access to the gutters. Next we will go up on the roof and clean out all the debris by hand and place into a bucket. Its faster for us to clean the gutters from the roof and safer for us too. We don't use leaf blowers as it makes a big mess and takes longer to clean up after its all over your house. Next we will check every downspout to make sure they are not clogged and that water runs freely through them. If we find that a downspout is clogged we will not use water to unclog it. Instead we will take the downspout apart, completely remove the clog by hand and reattach the downspout. Next we look for any loose spikes or hangers that attach the gutter to the home. If we see anything that is either missing or needs repair we will let you know and take care of it right there. There is an additional charge to repair this but is very minimal, usually around $5-$10 depending on what needs to be done. After we have completed the cleaning we will then bag the debris and take it with us unless you live in a wooded lot, at which point we will just throw the debris back into the woods. If you have a compost pile we will gladly add the debris to that as it makes great soil when broken down. After we are finished we will go back and put back any furniture or items we had to move. We will then present you with a bill or leave it in the mailbox. If you are home at the time we ask you pay the guys then, however if you would like to mail a check you have that option too. We also accept credit cards over the phone if you would like to pay that way.